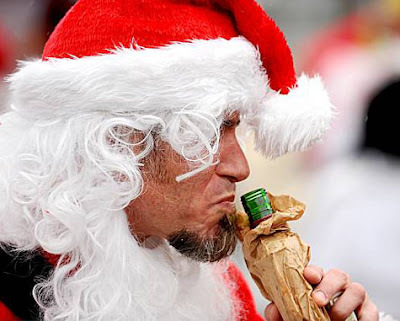 Michael Walters hits the sauce while reveling with other Santas during Santarchy on Saturday in San Francisco. Guess Michael Walters ain't no U.S. Marine Lance Cpl. Grayson Barnette! No wonder when I was young, I felt so uncomfortable sitting on Santa's lap. Wunder if that could be Farsi? "The Santa" is a guy movie! "Bad Santa" is a guy flick! No doubt in my head that was pure Art speaking to me. Still tho...I believe in Santa!! !